The Regina Kennel and Obedience Club was formed in 1916, with Norman MacKenzie K.C. as the first President, and Lieutenant Governor, The Honorable R. S. Lake, the first Honorary President. 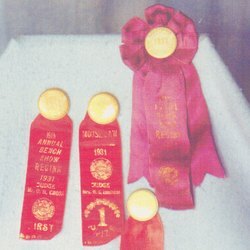 In 1916, the first Annual Dog Show was a four day event held in conjunction with the Regina Exhibition at the Exhibition Grounds. In 1921 there were exhibitors from as far away as Ontario, British Columbia, and Missouri, USA. At one time, the Club held both a Spring and Summer show each year. Our Annual All Breed Championship Dog Show is now held each May and continues to attract dog enthusiasts from across Canada and the United States. Our	Annaul Obedience Trials are held in October. As a member of the Canadian Kennel Club (CKC) we have set our training standards in accordance with the CKC for both conformation and obedience. Members of the RKOC are always delighted to bring their dogs out to public events, schools, seniors centers, clubs and Christmas parties to provide entertainment and education. Members of the RKOC enjoy modern training facilities and many social activities. The environment provides dog enthusiasts the opportunity to share their stories and exchange ideas. Memberships are available and provide many opportunities and benefits.